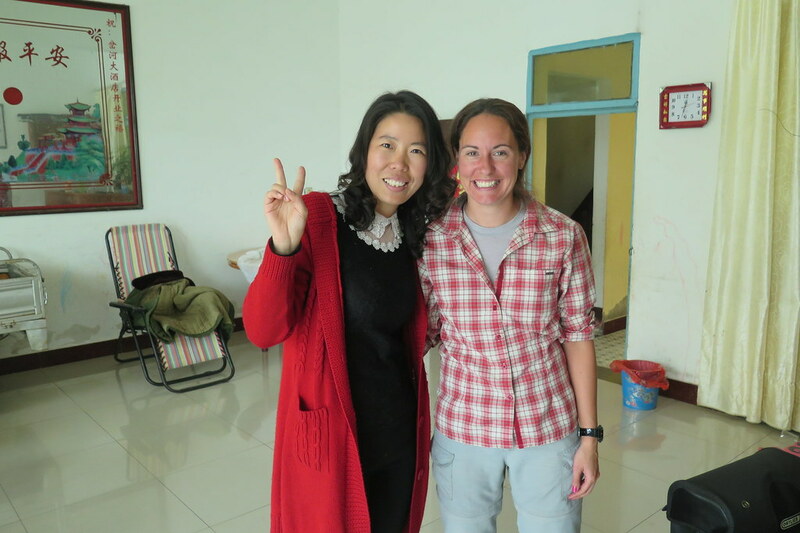 The experience of taking the boat from Korea to China, although a bit unclear and confusing at times, was actually a lot less stressful than we were expecting. The Incheon – Lianyungang route isn’t a particularly major one, so there wasn’t a huge amount of information available online. We chose it as it took us as far south as possible in China, as we’re racing south to get away from the cold as winter sets in. At LYG C-K Ferry office in Incheon, we were met by a Mr Lee who was expecting us, after Kung very kindly made our reservation. He was really interested in what we were doing, as they don’t get a lot of foreign customers. He said he’d make sure we had a comfortable trip, and asked that we tell our friends about the company. 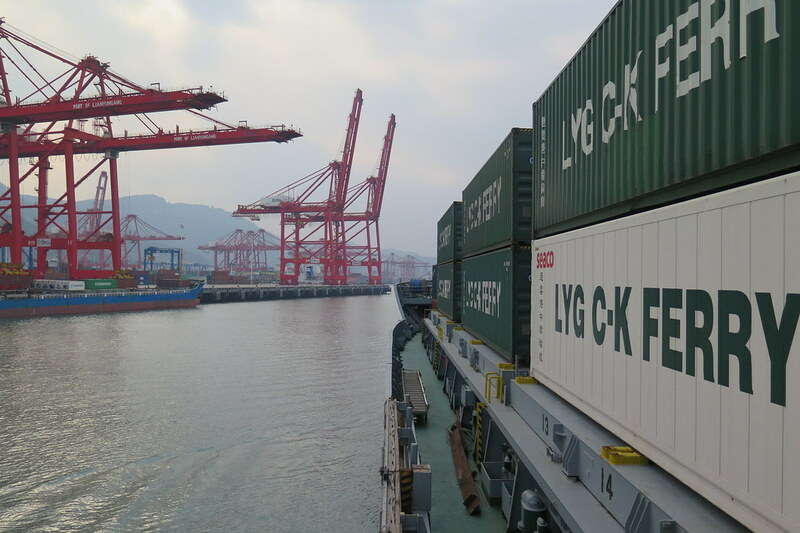 So, if you’re looking to travel by sea between South Korea and China, we can wholeheartedly recommend LYG C-K Ferry! 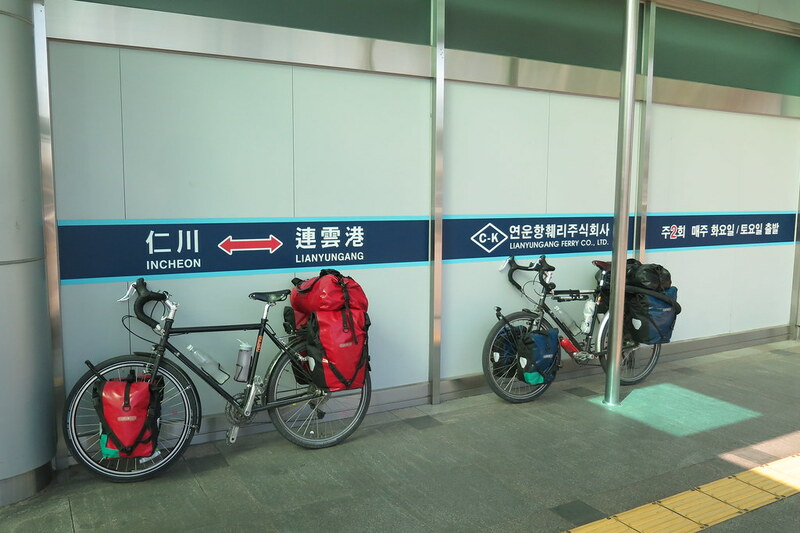 We had to wheel our bikes through the terminal and have our panniers x-rayed. I got called back and asked to open my pannier with our cooking stuff. I figured I’d be saying goodbye to our fuel bottle for the camp stove, but it was our folding knife that they were after. It was a 100 yen job from Daiso, so no worries about that! Then we had to put our bikes onto a bus to be driven out to the boat. This was a pain, as we were competing for space with the boxes and luggage belonging to the other passengers. We then had to carry everything up the steps from the dock onto the boat, but there was no shortage of helpful porters to assist us. The boat was mainly a container ship, with a section at the rear for passengers. The other passengers were almost all Chinese, looking like they’d been on a shopping trip to Korea to buy rice cookers and other consumer electronics. Kung had warned us when he booked that we’d be in 4 bed cabins, but separated, as there are men and women’s cabins. 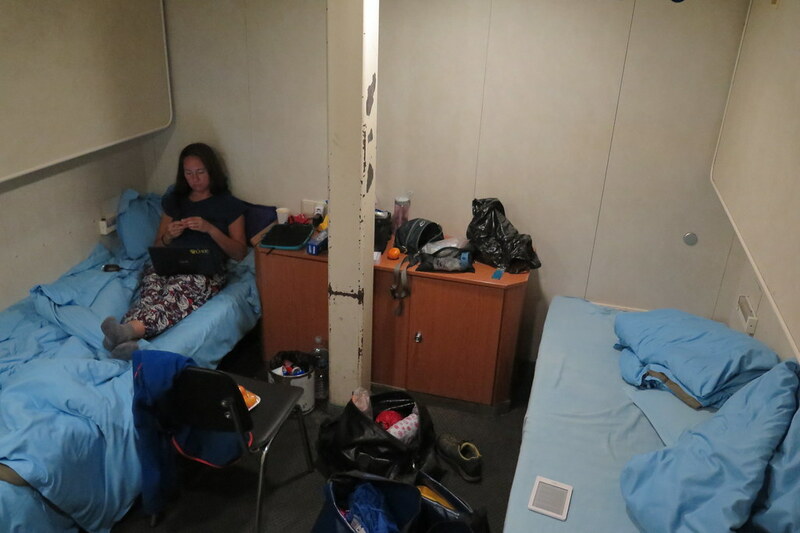 As it turned out, we were indeed in two different cabins, but we were the only passengers so we had the two rooms to ourselves! It wasn’t exactly a cruise ship, but we were comfortable and had some privacy. The boat left mid afternoon and sailed out through the many small islands off the north west coast. We went right past Incheon Airport which was a little surreal, as we’ve been through there so many times by air. 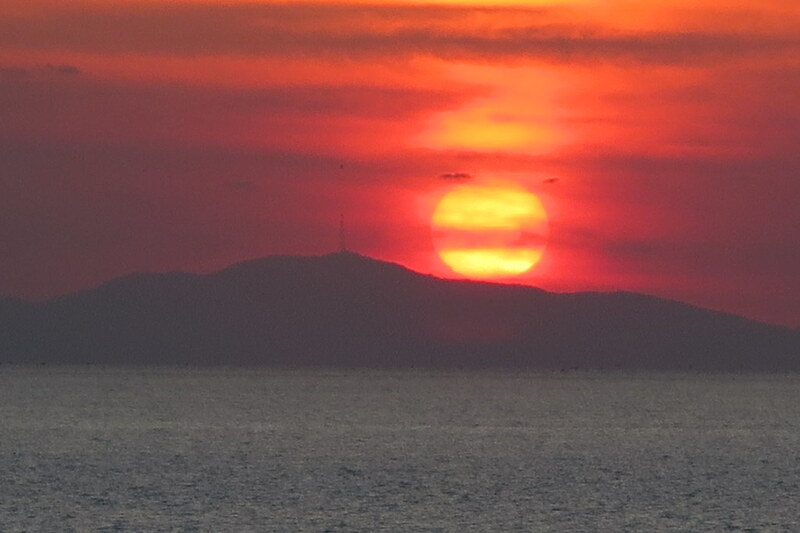 After a beautiful sunset, we went in for dinner, where we really started to feel like we were in China. We were squeezed into two free spaces on a large round table in a busy dining room. The food was Chinese and pretty good, even if we didn’t know what we were eating mostly. The table manners around us were, different. 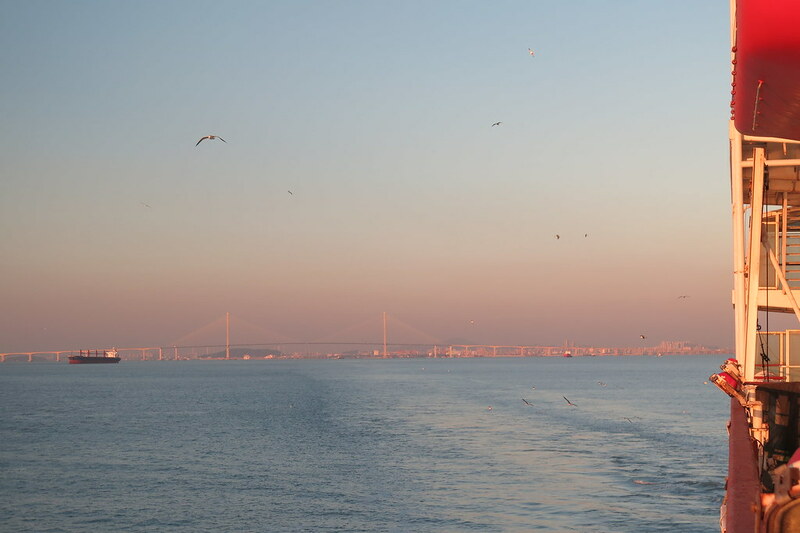 A good sleep and a chilled morning watching tv shows on the laptop, then before long we saw land and were arriving into Lianyungang port. When we docked, we were told that we’d be disembarking last, and to sit and wait with our stuff. After about an hour of waiting, it was our turn, and again, we had people helping us to carry everything down to the dock to board another bus to take us to the terminal building. Passport checks and customs were super quick, the people were friendly and helped us with our gear, so we were out and in China within 15 minutes. It was getting dark so the immediate mission was to find a place to sleep. 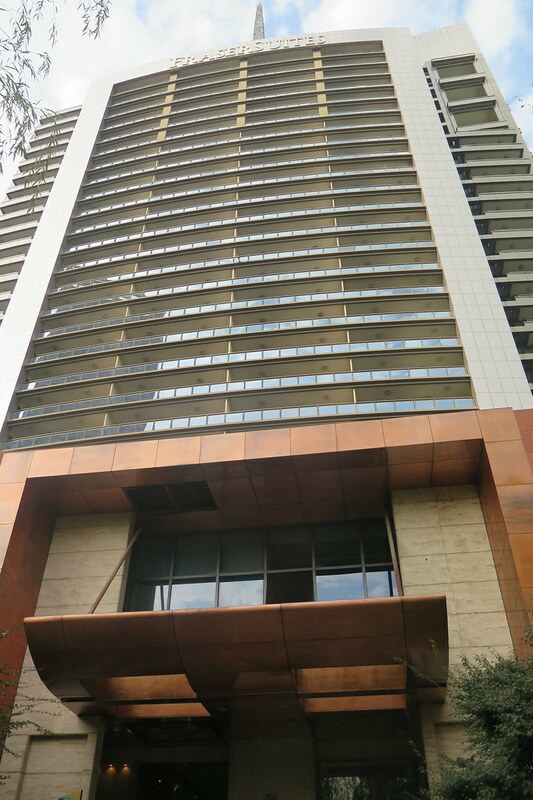 We headed towards some taller buildings, via a cash machine, and found a hotel quickly. It was expensive, but worth it to be into a hotel room so soon after getting off the boat. Plus the checkout time was 2:00pm the following day so it meant we could have a real lazy start. 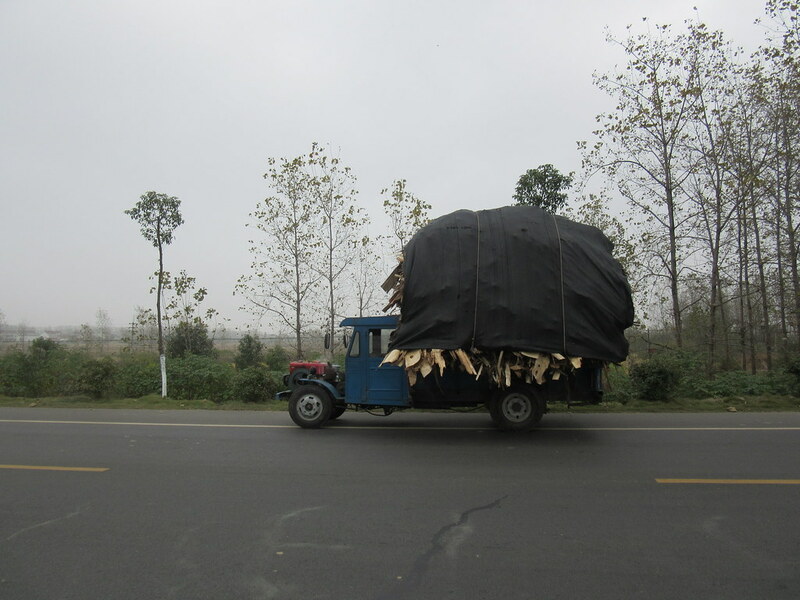 The next day, leaving the hotel, we had no idea what to expect and were feeling quite apprehensive about the big scary roads of China. Which were, not really too scary at all actually. All the roads in town had really wide lanes for cyclists and scooters, keeping us nicely separate from the trucks heading away from the port. 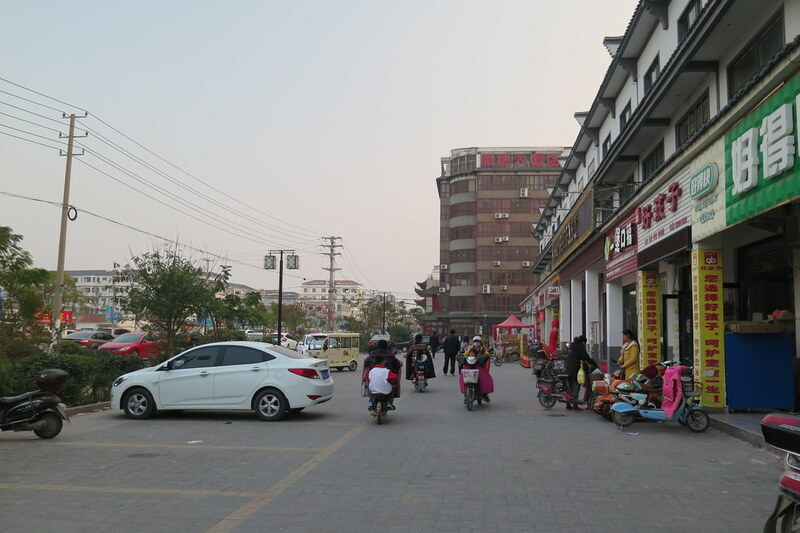 Lianyungang isn’t a big place in China terms, but it’s a large city which took most of the afternoon to get through. A lot of the outskirts were made up of new, but empty sky scrapers. 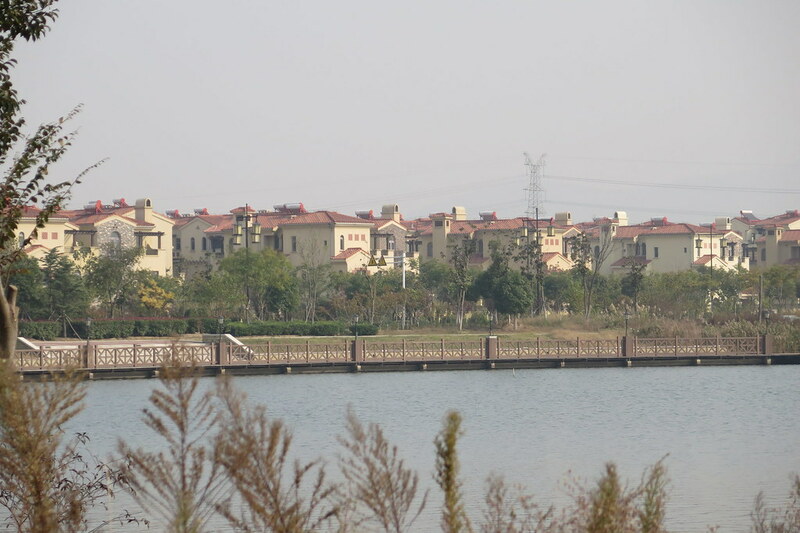 One area was all Spanish style villas next to a lake, again totally empty, with wide roads devoid of any traffic. Quite eerie. Coming into China, we crossed into a new timezone, going back one hour. So it gets dark quite early. 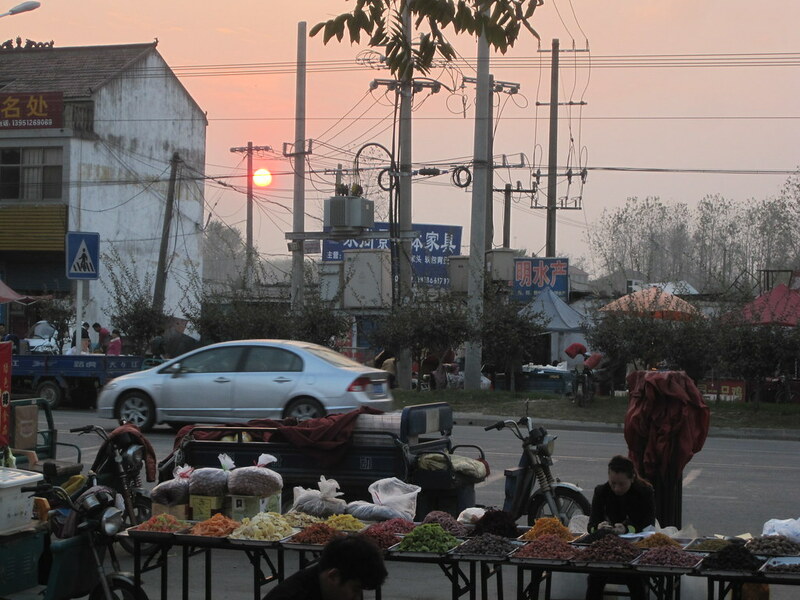 After 40km on day one, dusk was starting to come in so we looked for a hotel in the next town we came to – Bampuzhen. 100 yuan or around 10 quid got us a huge room which was clean enough and had wifi, even if we did run out of water before we’d both had a chance to shower. 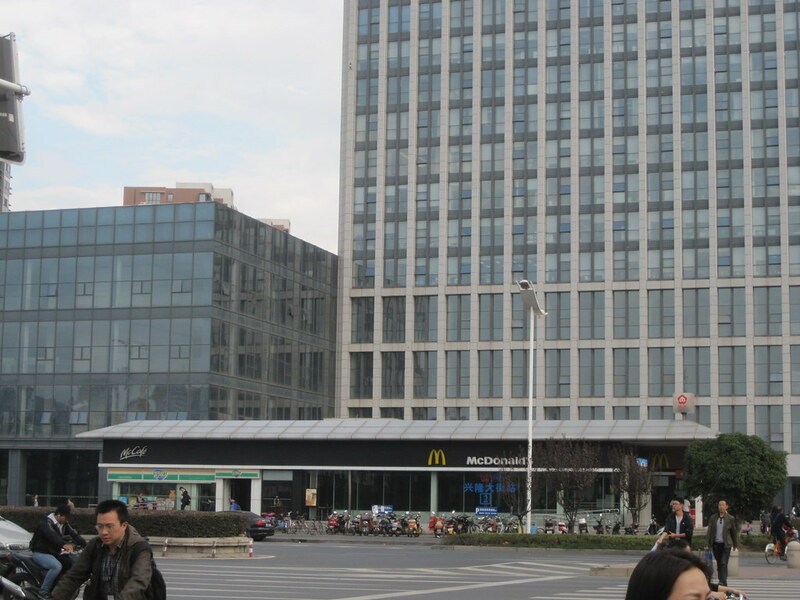 So far we haven’t camped at all in China as we’ve always been able to find hotels at 100 yuan or less. Maybe it’s cheating a bit, but as food is so cheap too, we’re still well within our budget. After a slow start the first day, we did our best to get away early and hit the road. 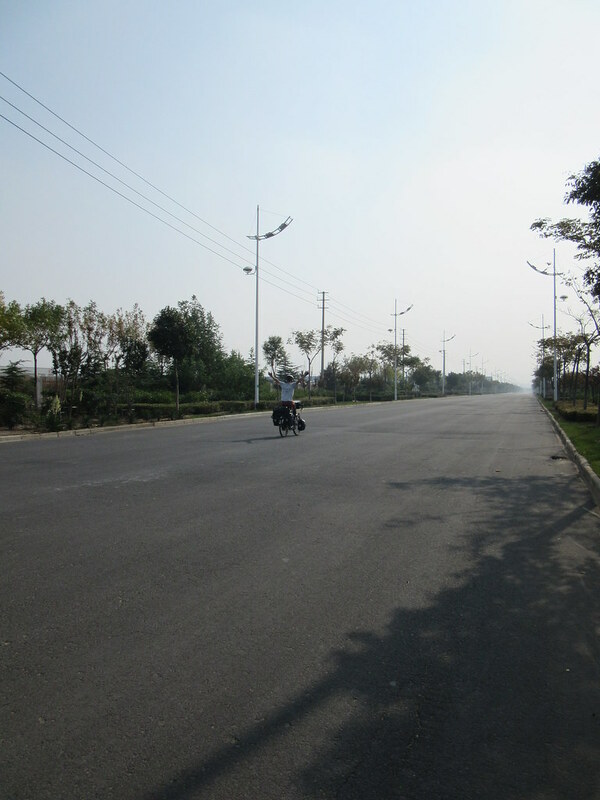 The route finding was quite easy, just mainly following minor roads south in the general direction of Nanjing. 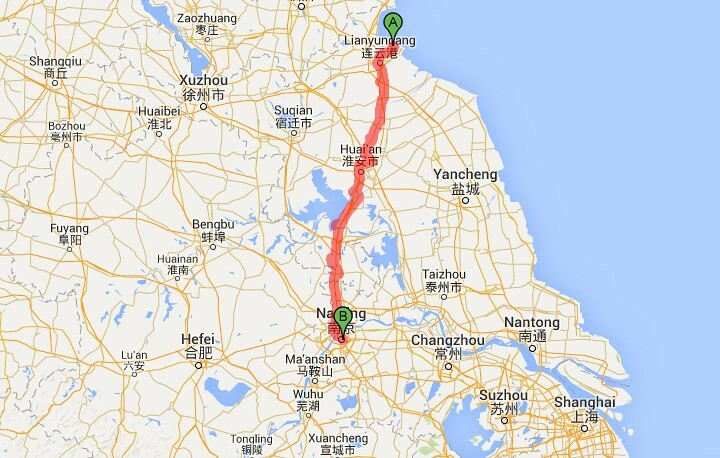 I’d contacted a Warm Showers host, Jim, in Nanjing so we were aiming to get there by the weekend. It has been quite easy to cover decent distances, even with the odd diversion or backtrack due to unfinished roads or missing bridges. 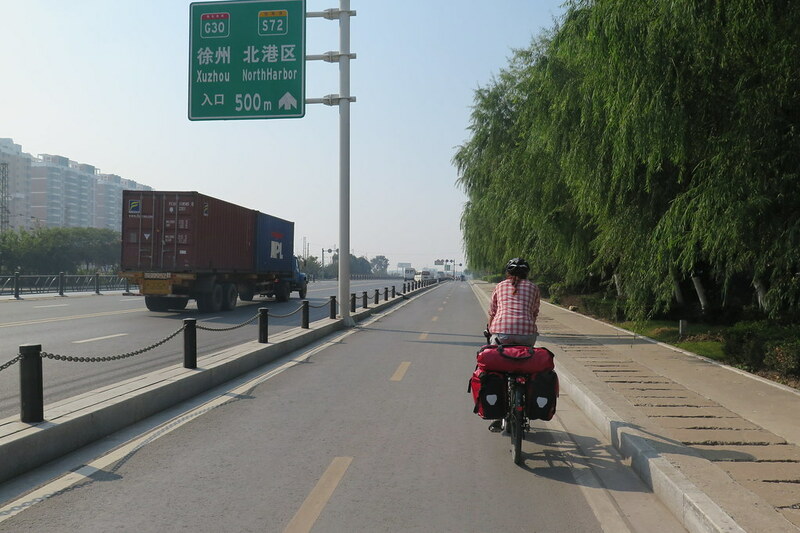 There’s all manner of other traffic, scooters, tractors, speeding luxury cars, huge trucks, but they have been giving us a wide berth and the roads have wide shoulders that we can cycle in. We’ve been trying to stick to ‘S’ or ‘X’ roads which I think are the minor countryside roads and are quieter than the ‘G’ roads. Outside of the towns, every 20km or so we pass small settlements with rows of shops, car workshops and restaurants. We stopped at one where we saw a phone shop and went in trying to get a Chinese SIM card for our phone. No go it seems, and the staff didn’t know how to help us. One guy got on his phone to someone who could speak English and passed it to me. Still it seemed like it was a no go, but it was really kind of him to try and help! We bought some biscuits from the shop and sat on the steps for a coffee. 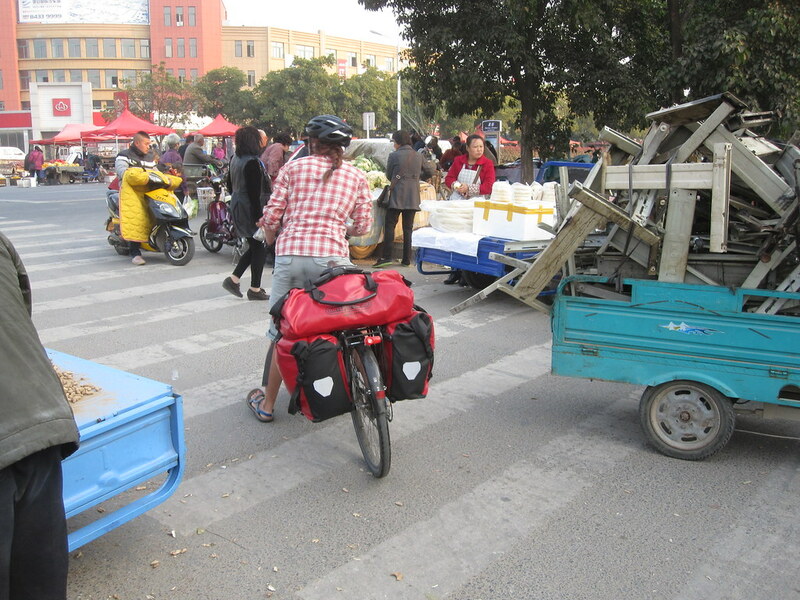 A small crowd had gathered, and a bench was brought out for us to sit on while they interrogated us in Chinese, to which we nodded, smiled, pointed at our bikes and made gestures. We generally stop for lunch in small restaurants in these settlements. No menus, but we just point at ingredients in their fridge and agree on a price, then something is brought to us. Its been really tasty so far, even if we’re not sure what we’re eating and sometimes feel like we’re not getting the price the locals would get. One lady however, after we’d agreed on a price and eaten our lunch, seemingly had a change of heart and said it was free! She just said ‘welcome to my town’ and asked to have a photo taken with us. 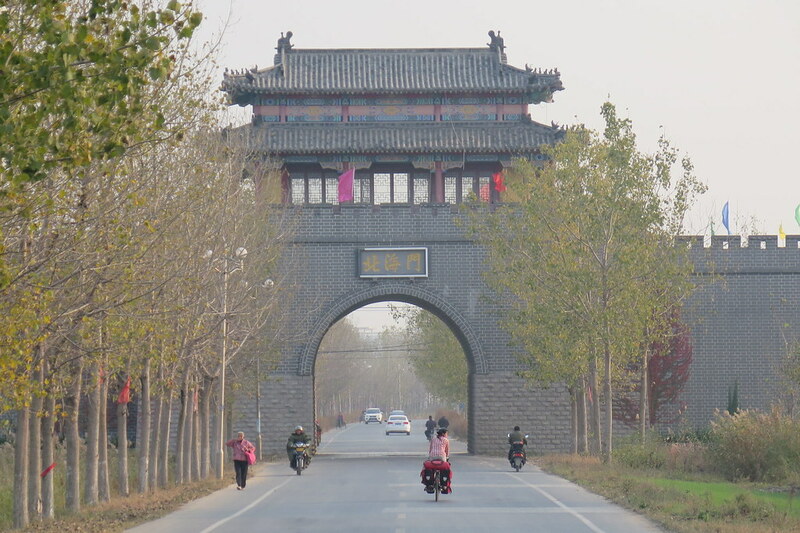 Day 2 of cycling was 102km and got us into Huai’an. We stayed at a ‘Hotel 8’ on the outskirts of the city. Nice and cheap but not much soundproofing in the rooms! We had a bit of a wander round the market outside the hotel, looking for a facemask and some sunglasses. The smog and dust on the roads has been getting to our throats and eyes by the end of a day cycling. We might have to wrap up Korean style when we’re riding in more populated areas. 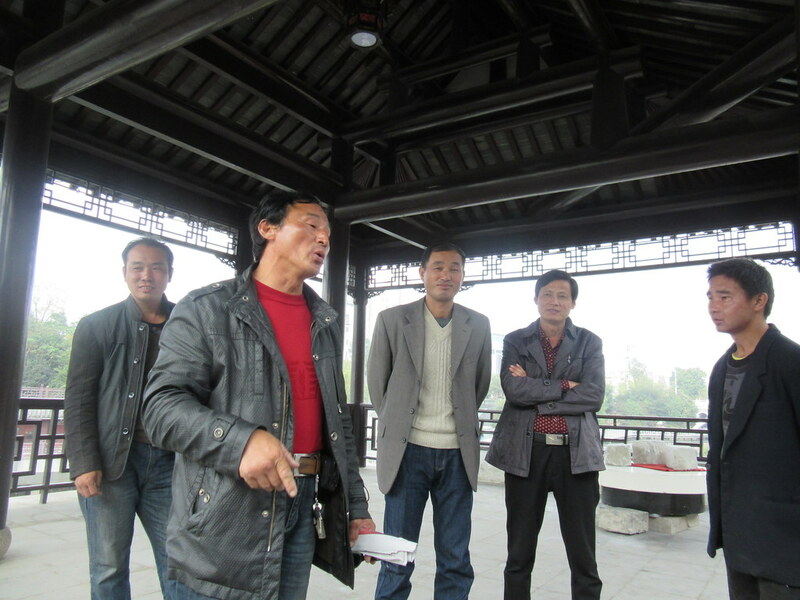 Getting out through Huai’an the next day took a while. A small city on the map, but with over a million inhabitants. The cycle lanes were busy with scooters and other cyclists so it was slow going. At one point in the city centre, the lane went under a large road junction where there was an underground roundabout, just for two wheeled traffic. With a low ceiling and no real visual references it was pretty disorientating, but we took the right exit and emerged on the right road out of town. This road was the road we’d be on all day. With very few corners or features, a grey sky and a headwind, it wasn’t the most enjoyable day in the saddle. After about 70km we crossed a long bridge, about 4km long over a wide river. On the descent coming off the bridge, I got a puncture in my rear tyre. A chunk of metal in the road that I hadn’t seen as I was looking down at the river. 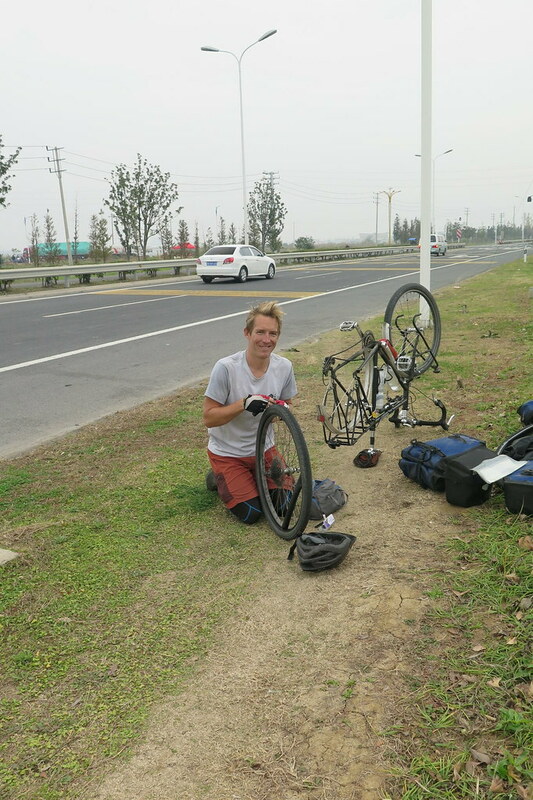 After changing the tube, we decided to call it for the day and headed into the next city, Jinhu. 70 yuan for our hotel in the city centre. 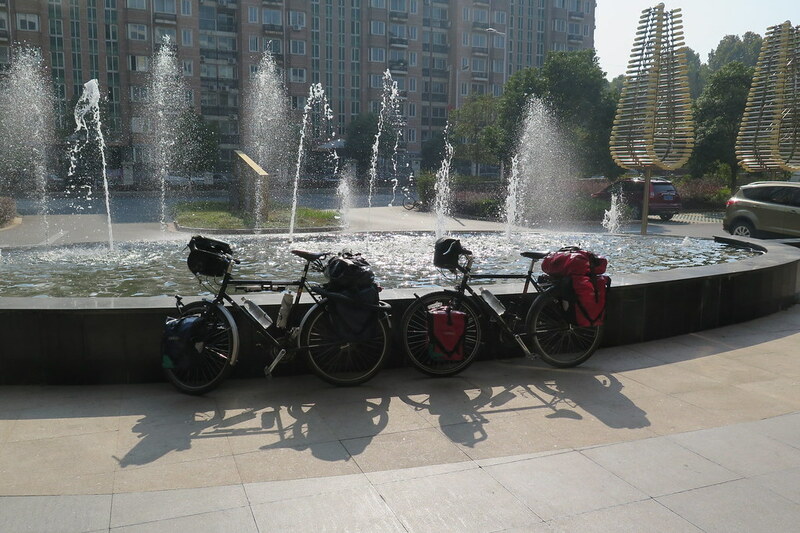 The next day we had a tailwind and a plan to get as close to Nanjing as we could meaning we’d have a leisurely ride into the city on Friday. It wasn’t the best start as the road that we’d planned to take trailed off to a dirt track and then a dead end. Big backtrack and a while to find an alternative. After that we made good progress for the day. 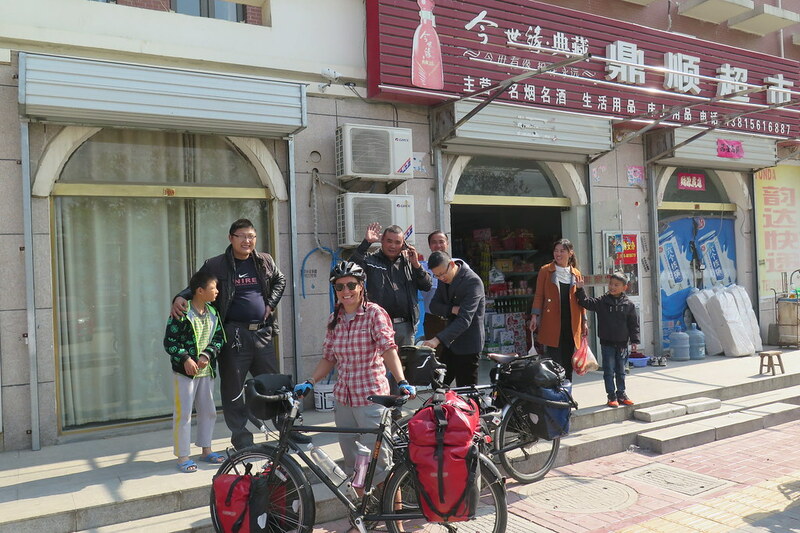 At lunchtime we stopped next to a lake in Tiancheng and were immediately surrounded by a group of guys who were fascinated by us and our bikes. Bit awkward cooking and eating our noodles with our every move being watched, but it meant we didn’t hang about and were back on the road quickly. The afternoon was interesting as we went through some more hilly terrain and past a few lakes. So far everywhere has been very flat, not that we’re complaining, but some variety is nice! By mid afternoon we reached a larger road with an elevated trainline running above. 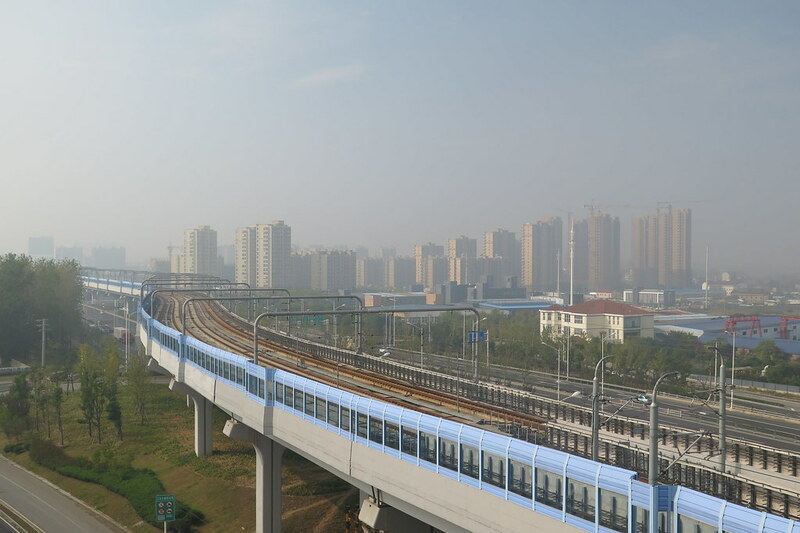 This was the start of Nanjing’s urban sprawl. We pushed for the rest of the day to get over the 100km mark before stopping. Of course, by the time we hit the 100, there wasn’t a hotel to be seen, so we had to continue further until we found a spot to stop. 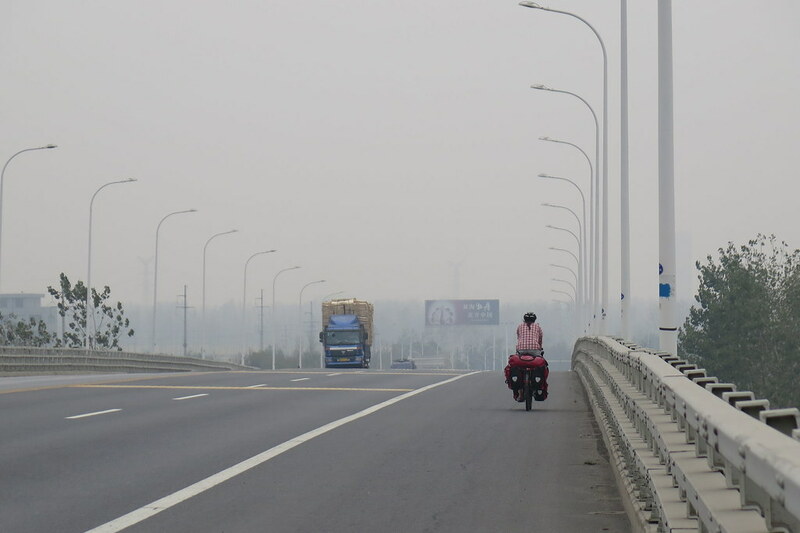 We couldn’t really see much through the smog, but the tall buildings and larger roads told us we were definitely getting closer to the centre. The map showed us we had around 35km to ride the following day to get to our Warmshowers host. 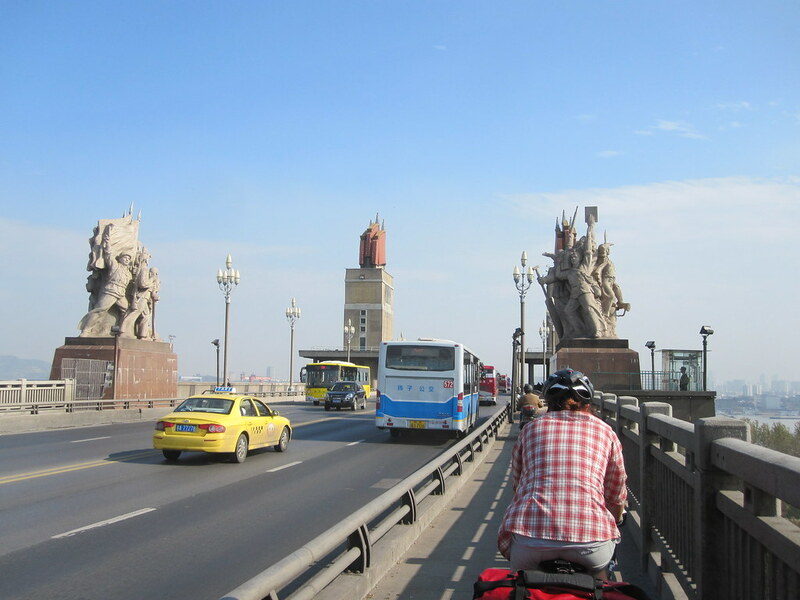 The next day was all urban riding, but fairly easy with the wide cycle lanes beside main roads. Annoyingly, I got another puncture about halfway in, which held us up a bit but we were underway again before too long. 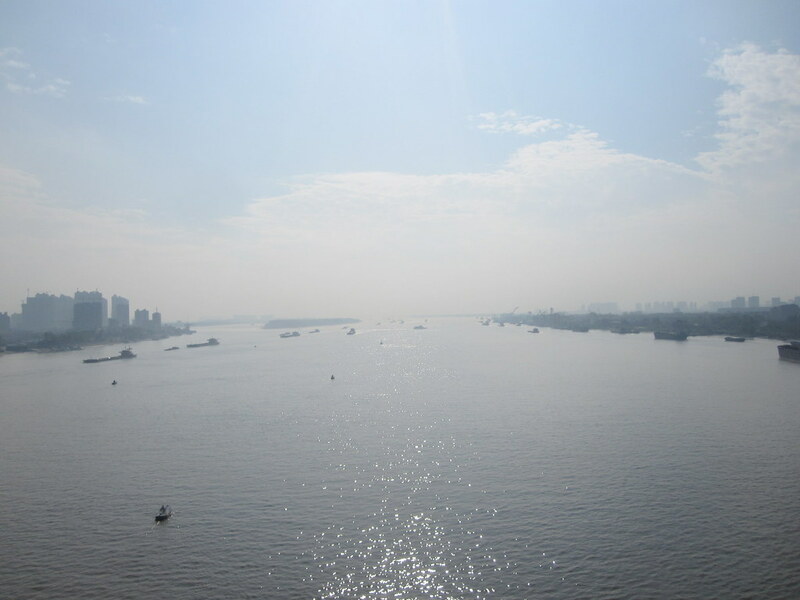 The main boundary for Nanjing city proper is the mighty Yangtze river. 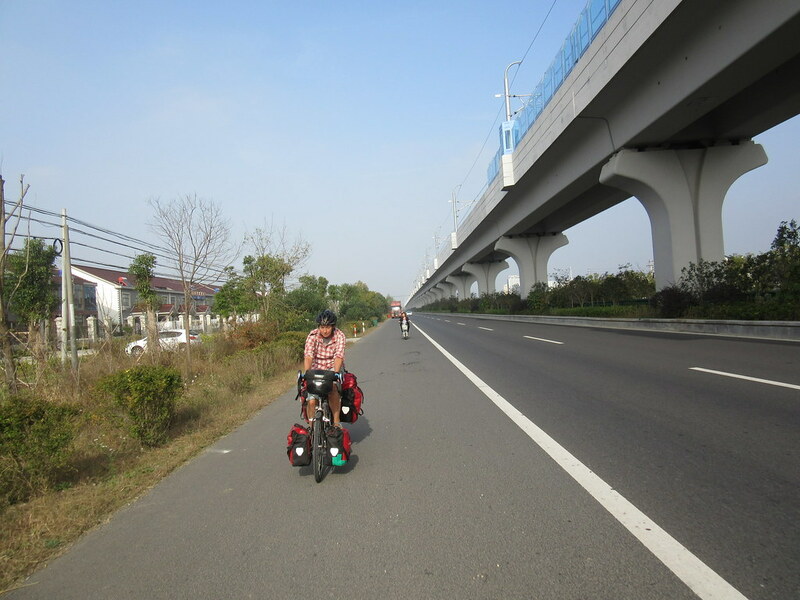 We crossed over on the Nanjing Yangtze Bridge which was one of the few options for bicycles. The narrow cycle lane was pretty sketchy though, with only just enough room for scooters to pass us. On the other side of the river we were into a big modern Chinese city. Lots of luxury car dealerships and designer fashion stores. Plus McDonalds, Pizza Hut, KFC and all the other international chains. 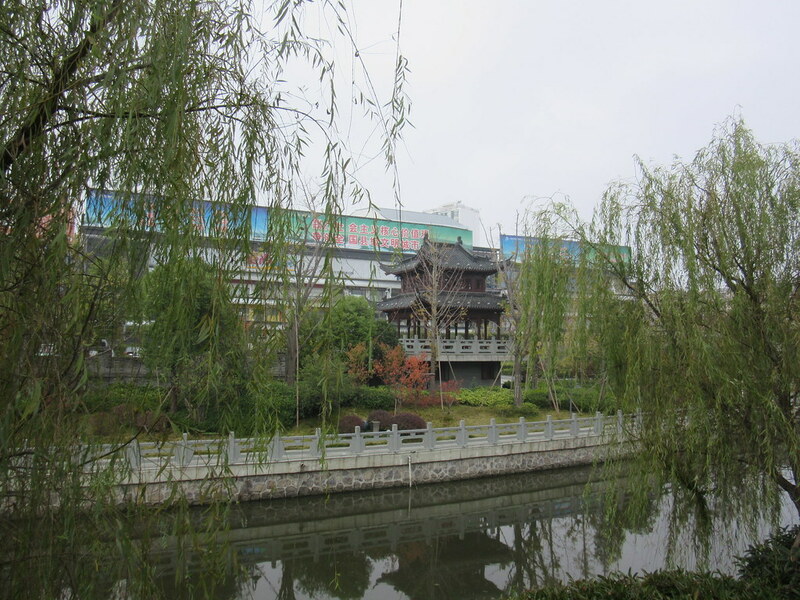 We got to the Nanjing Olympic park, site of the Youth Olympics from last year and were on the look out for the Fraser Suites building, where we’d been told we had a place to stay. Walking into the lobby in our shabby cycling clothes we felt very out of place in this luxury apartment building. Jim, our Warmshowers host had arranged with his colleague, Chen for us to stay in a spacious two bedroom apartment with a huge living room and kitchen area. We couldn’t believe our luck and this amazing generosity towards 2 cycling strangers. 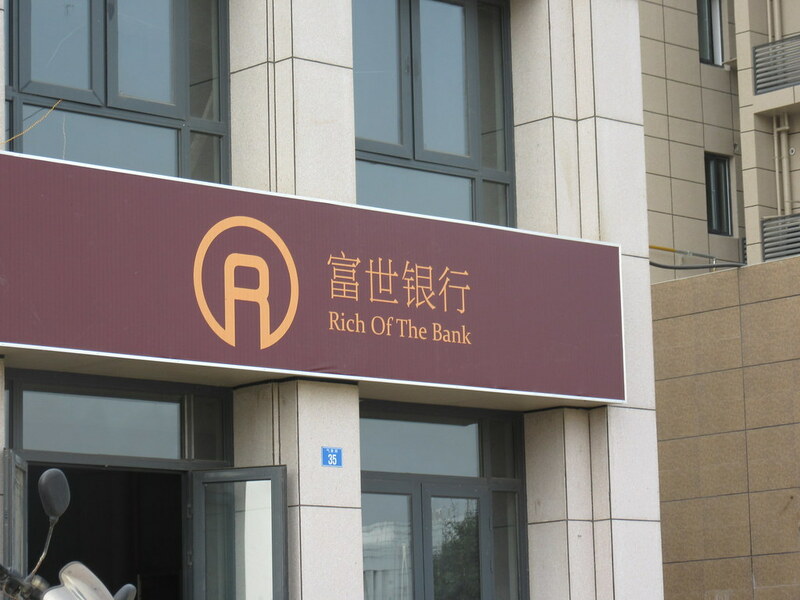 So we’ll spend a couple of days here in Nanjing, mostly relaxing and making the most of being in this awesome apartment, but we’ll also do a bit of sightseeing. From here we’ll continue south into Anhui Province in the general direction of Hong Kong, where we’ll aim to arrive by the end of the month.